Stump removal and grinding is done based on the integrity of the tree stumps and the preference of each client. Although tree stumps can provide an unsightly appearance to some yards, their removal may often be worse if not tackled by professionals. In removing a tree stump, many lawns are often left with a gaping hole in place of where the stump once was, while the option of leaving the stump to grow over can bother others who are concerned about their landscaping. Stump removal involved the extraction of the tree stump from its roots upwards. Since many stumps have been in the ground for several years, it can take some time to loosen all of its roots and remove it from the ground. Once completed, many clients are often left with a large hole in place of where the stump was. To avoid this unsightly appearance or injury, we are able to perform reseeding and filling services that help to reduce the appearance of the hole. Over time, the hole will eventually fill itself naturally but can be speeded up with the use of filling agents, soil, and fertilizer. If you have opted to keep the stump in your yard and simply want to grind it, we can offer our superb grinding services. Grinding is the practice of shaving down the existing stump to reduce its appearance. Stump grinding is done with the use of an electric saw grinder that helps to evenly grind the surface area of the stump. Stump grinding is not something that needs to be performed regularly, but can be performed yearly to maintain the height of the stump and according to personal preference. 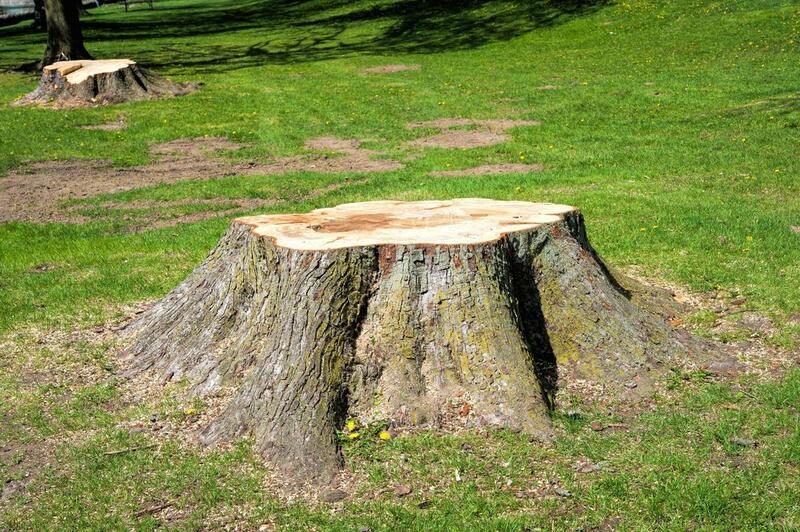 For those that have opted to have a stump removed, many clients ask us what happens to the stumps that we dispose of. The truth is, although we remove them from your yard, they’re never disposed of completely. In fact, we assess the stump to see if it is reusable. If so, we grind the stump into small clippings and recycle the clippings as landscaping mulch. This helps to reuse the leftover materials from the stump, while also ensuring that our practices are eco-friendly and sustainable. If a stump that we’ve removed is infested with disease or pests, we’ll likely dispose of it as it cannot be reused. Transplanting is the practice of moving a tree from one location to another. While it’s not too common, it is requested from time to time. Tree transplanting is an incredibly delicate practice and should be handled with care, as the rupture of a tree during transplanting can cause it to react negatively altogether. Sometimes we find that transplanting a stump can be easier than an entire tree, and this all depends on the tree’s overall health. If we believe a tree is eligible for a transplant, we will work with you to determine what the next best steps are and if necessary we'll bring it down.